Binh Dinh is a coastal province in the South Central Vietnam, with a total natural area of 6,025 km2; being bordered by Quang Ngai Province to the North, by Phu Yen Province to the South, by Gia Lai Province to the East, and by South China Sea (East Sea) to the East; 1,065km south of Ha Noi, 686km north of Ho Chi Minh City, 300km south of Da Nang City, and 300km east of Bo Y International Border Gate (in Kon Tum Province) to Laos; being one of the five provinces in the Key Economic Region of Central Vietnam (the others are Thua Thien - Hue, Da Nang, Quang Nam and Quang Ngai). Binh Dinh lies in the middle of the North - South route (National road 1A and trans-Viet railway) and is the most convenient gateway to the sea for the Central Highlands, Southern Laos, Northeastern Cambodia and Thailand (through National road 19 and Quy Nhon international port). With Phu Cat airport, it takes only 1 hour to fly between Binh Dinh and Ho Chi Minh City and more than 1 hour to fly between Binh Dinh and Ha Noi. In the near future, the construction of Nhon Hoi seaport of Nhon Hoi Economic Zone will improve the provincial transport infrastructure, giving Binh Dinh a prominent advantage of regional and international communication. 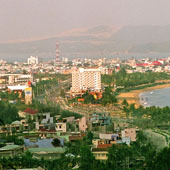 The province has the capital city named Quy Nhon and 10 districts, including 3 mountainous districts. Quy Nhon City is the second-grade city with an area of 284.28km2 and a population of more than 284,000; being planned to become the first-grade city in 2015 with 334.73km2 in area and 500,000 inhabitants and determined by the Government as the central city of the south of the Key Economic Region of Central Vietnam, and one of the centres of international trade and service and transaction of the whole Central Vietnam and Central Highlands.